I bought a ROK and highly recommend it, it’s a routine you quickly get used to and behaves much like a traditional machine in terms of loading the portafilter. I’ve also heard great things about the Aeropress. These machines remove the need for an electric pump to create the pressure to push the water through the coffee. They’re much simpler, have fewer moving parts that can break and use no electricity for pumping water. Best of all they brew equally good or better coffee than comparably priced machines that you’ll enjoy making as much as you enjoy drinking it. Quite similar to the Handpresso below the Minipresso by Wacaco is a startup that hails from Hong Kong. It works both with freshly ground coffee and capsules (Caffitaly System & Tchibo Cafissimo). Not only is there no motor but the Handpresso is very portable also, all the while generating an impressive 16 Bar of pressure. Made by a French company of the same name this espresso maker is available locally from Bombora coffee supplies. Designed and built in England the ROK uses an innovative and stylish design incorporating two levers to force the water through the coffee. It incorporates a a traditional portafilter setup. From the people that brought you the Aerobie (the frisbee like disc, seriously) comes the AeroPress. Widely stocked in coffee shops around Australia and available for purchase online (see the Australian Aeropress distributer website contains a complete listing). 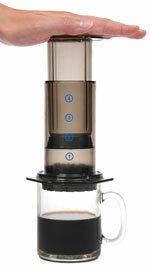 The AeroPress ships with non re-usable paper filters which can be replaced with the Able Stainless Steel Disk filter. Invented in the 1930’s and in production since Bialetti stove top unit pushes boiling water pressurised by steam through the coffee. More information on the history of this machine is provided in the Moka pot Wikipedia article. A very similar coffee maker to the Moka pot is the Stella stainless steel stovetop espresso maker. Whilst not as simple as a the machines above but still with out an electric pump is the ornately designed Electra Casa a leva machine. Also made in Italy and equally as beautiful as the Elektra, la Pavoni offer a greater range of lever driven espresso machines that similarly include a milk steamer. The Australian importer, distributor and retailer is Euroespresso. Manufacturered in Taiwan by Bellman since 1984 their stove top milk frother provides pressurised steam using only water and heat from your stove top – no pump and no moving parts. Better known for the filter coffee makers, Bodum provide a very similar device that froths pre-heated milk with a mechanical action. Specialist Japanese manufacturer of ceramic burr products Porlex produce a high quality and well respected hand grinder that you can use at home if you’re energetic or keep it solely for when you’re travelling. More english information is available through the Australian distributor Porlex Australia. Orphan Espresso Design Shop started life as restorer’s of vintage hand coffee grinders morphed into a boutique manufacturer of new machines. CoffeeGeek have a great review on this grinder for more information. From the makers of the amazing ROK espresso machine above comes a revolutionary grinder. You can buy the grinder from their Indiegogo listing. Great listing! The Aeropress is an excellent brewing device and can even be taken travelling (a Porlex hand grinder conveniently fits inside too). We only sell products that we love and we can certainly vouch for those two items!